GenBlog: I’m an FGS 2013 Conference Ambassador, Have You Signed Up Yet? I’m an FGS 2013 Conference Ambassador, Have You Signed Up Yet? Yesterday I received an email from the Publicity Chair, Tina Lyons, for the 2013 Conference of the Federation of Genealogical Societies. All genealogy bloggers, societies, writers, and editors are encouraged to become an Ambassador for the conference, which will be held August 21-24 in Fort Wayne, Indiana. An Ambassador is someone who will help promote the FGS 2013 Conference through blogging and social media. If you are interested in becoming an Ambassador, take a look at the press release below. Then all you need to do is sign up (by filling out a very short form), grab the Ambassador badge, and start promoting the conference! April 8, 2013 – Genealogy bloggers, societies, writers and editors are invited to participate in the Federation of Genealogical Societies 2013 Conference by becoming FGS 2013 Ambassadors. 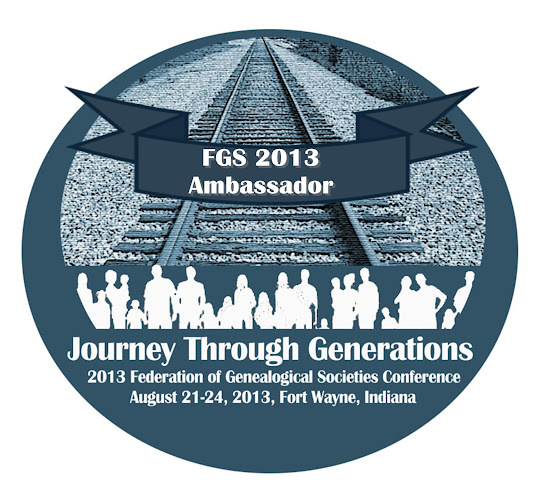 Ambassadors help to spread information about the FGS 2013 Conference in Fort Wayne, Indiana, August 21-24, through social media to their friends, colleagues, and everyone interested in genealogy. Participating in monthly blogging prompts. Writing about the conference on their blog. Using the hashtag #FGS2013 on Twitter. Mentioning FGS 2013 on Facebook, Google Plus, and other social networks. Letting their local historical and genealogical societies know about the conference. Visit https://www.fgsconference.org/media/ambassadors/ to register as an FGS 2013 Ambassador and find the FGS 2013 Ambassador badge to add to your blog or other social media account. Giveaways for active ambassadors, including conference registrations and discounts, special event tickets, and more. Potential to be guest blogger on FGS Conference Blog. Link to your blog or website on the FGS Conference blog's Ambassador Page. Part of Twitter list of FGS 2013 Ambassadors. The FGS 2013 Conference Committee looks forward to working with the FGS 2013 Ambassadors to make this conference a success. See you in Fort Wayne in August! Visit the conference website at http://www.fgsconference.org. Find the latest news on the conference blog at http://www.fgsconferenceblog.com. Like the conference on Facebook at http://www.facebook.com/FGSconference. Follow the conference on Twitter at http://www.twitter.com/FGSconference and hashtag #FGS2013.